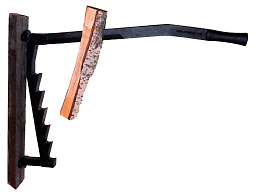 The Stikkan® is a heavy-duty, cast iron hand tool that is used it to make piles and piles of softwood kindling fast, easily and safely. Originally invented in Norway in 1982, it is currently manufactured by hand in Foshaga, Sweden and distributed nationally by Tar River Trading Post, LLC. Designed for indoor or outdoor use, the patented Stikkan mounts easily on a wall, fence post or even a tree. 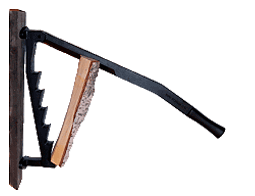 This essential tool allows you to make your own kindling for your fireplace, wood stove or clay oven. Developed with pride to last a lifetime. Beware of cheap imitations - they do not last. Simply mount to a stable wall or sturdy post (no plaster board) approximately 48" (120 cm) from the ground to the higher screwholes. Four lag screws are included; mounting holes are spaced on 2-5/8" centers. To operate, simply raise the 22-1/2" arm and insert the wood stock up to 14" long into one of the lower bracket notches and press the steel blade into the wood. Reposition the wood on progressively higher notches to help maintain ample leverage until full splitting occurs. 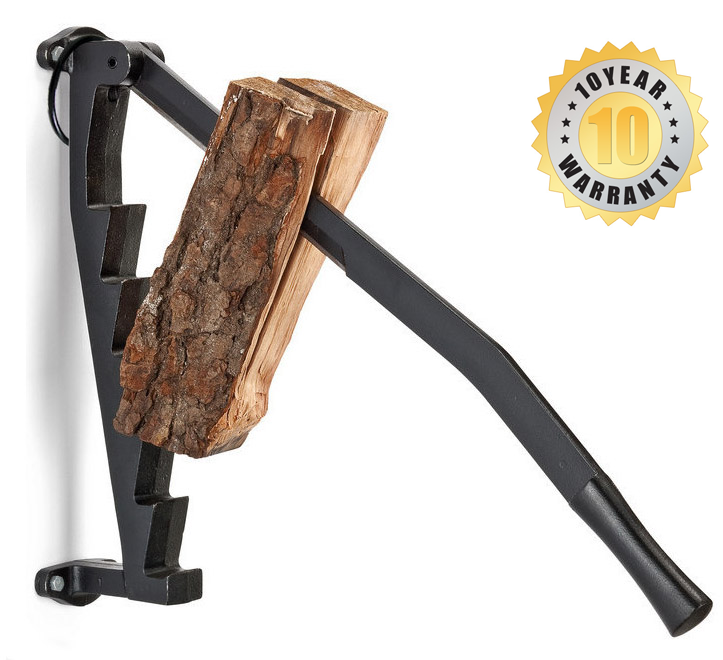 The sturdy hinge restricts side-to-side blade movement, making the splitting process more controllable and safer than using an axe or chainsaw. Stikkan's elegant curves and compact design affords the operator with a myriad of choices for placement in or around the home, shed or barn. Softwoods like pine or spruce are ideal since they split easily and ignite well. When not in use, an included safety ring slips over the end of the arm to secure it in the closed position. To minimize the risk of injury, place device out of reach of small children. Don't initially place the new wood piece too high on the steps; start low and move up as needed so that slippage does not occur and leverage is maximized. To ensure proper performance, do not use wood pieces that are overly long (14" in length or less is recommended). Avoid logs too large in diameter as well. 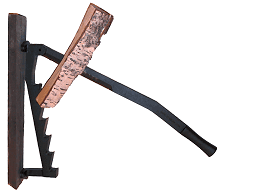 Save your back and put away your hatchet! 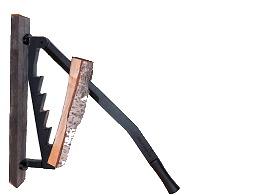 Virtually anyone old or young can make large, unlimited quantities of softwood kindling for a multitude of uses around the home, without the dangers normally associated with hatchets, chainsaws, axes or mechanized splitters. 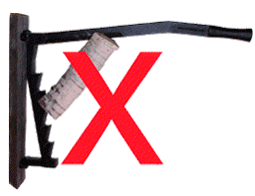 No need to forage around the snow-covered ground collecting twigs when you can safety split your own kindling without the need for oversized muscles, power or hearing protection. Make it as-needed or for winter stockpiling. While durable enough for year-round outdoor use, the black passivated electrolytic zinc finish is also sufficiently attractive for indoor placement in the most lavish of domiciles. In some climates when exposed to the elements, the Stikkan will quickly develop a natural patina rust coating which permanently protects the underlying metal. The Stikkan has an impressive 10 year warranty and has been designed for a lifetime of intergenerational use.